Steel has improved in recent decades, becoming the most popular choice for modern construction services. From enhanced strength to more efficient fabrication procedures, this building material holds many advantages that can be hard to match. 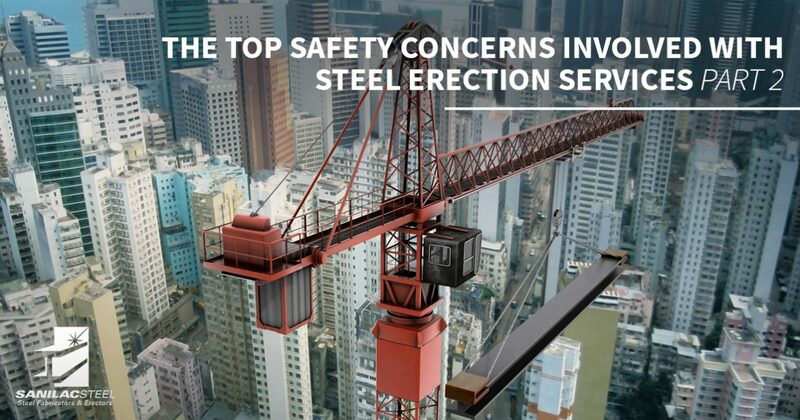 Unfortunately, the high popularity and high strength of steel can also create safety concerns, especially on the job site. If you’re seeking professional steel structure building services, it’s important to find a steel fabrication company that holds a record for safe, effective outcomes. Sanilac Steel is one of those outfits, and our team has been perfecting our steel erection services since 1967. Our steel erectors in Michigan have years of experience in the industry, working with the best equipment to provide optimal outcomes for all of our clients. While we focus on delivering amazing results, our top priority truly is safety. From design to steel fabrication to installation, it’s important to operate within safety parameters to ensure that each worker gets home safe to their family at the end of the day. Today, we’ll continue our look into the inherent dangers of working with steel construction and how our steel fabrication company continues to deliver the best services with a sterling safety record. Contact us today to learn more or to receive a quote for your project! Working from heights can be dangerous for more people than the worker completing the job above. 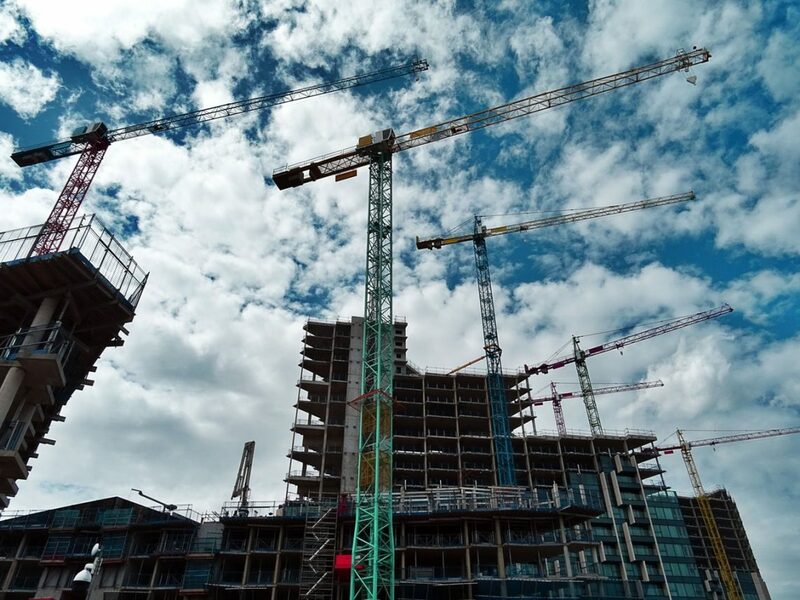 Falling objects are a common and real concern for nearly every construction project, as the high number of workers and large supply of materials make small errors nearly impossible to avoid. Being struck by a falling object can come in many forms, ranging from dropped bolts to a worker who was not properly secured at height. From a high elevation, even the most minor objects can cause serious injuries. Safety equipment. The hard hat is one device that should always be used on a construction site, no questions asked. Personal protective equipment (PPE) is mandatory in areas with falling object dangers, as your hard hat and safety glasses can go a long way in preventing serious injury. We train all of our personnel to wear the proper gear for the job, and our team is trained to point out safety concerns elsewhere across the site. Proper organization. Materials that fall from high areas, such as scaffolding, often meet this fate because the work space was not properly organized and any building components not being used were not properly stored away. Our team strives to keep their areas clean and safe at all times. Clutter is taken care of and any unstable materials are stored in a secured area. Safety barriers. While many measures can help to prevent falling objects, other approaches such as a safety net can help to mitigate fall damages once an object begins its descent. Our steel erectors will ensure that all of your entry points and walkways are properly covered to minimize the dangers below. We also focus on the proper installation of protective barriers to keep equipment and personnel safe from impact after falling. Marking the dangers. In many cases, injuries occur because an individual was not working in an approved area. Sanilac Steel takes pride in safety, and our contractors will place effective warnings for areas that are unsafe to use. Proper installations. After more than 50 years in the industry, our steel erectors are able to offer fast, effective results for crane installation services that serve to set the standard for safety. Our team will also perform the safety checks and maintenance procedures to keep our crane running smoothly throughout the project. Professional training. Even if you enact all safety measures on the site, one small error by the operator can cause big problems. It’s important to have a trained, experienced worker available to ensure that your crane operations are done safely. Additional safety devices. Our modern technology has paved the way for improved safety measures, from automatic brakes to warning devices. Radios are also important for creating open lines of communication between the crew on the ground and the operator in the crane. Smart planning. Cranes can be an effective tool when utilized safely for transporting large pieces and caches of equipment. One thing we’ve learned in the industry is the importance of planning and keeping your transport routes clear, avoiding obstructions to enhance safety and speed. Steel fabrication and erection services are inherently risky, but measures can be taken to optimize safety and create the best environment for completing your project on time and on budget. Sanilac Steel is here to serve as your safe and effective steel erectors in Michigan, delivering quality results to each of our clients. We believe in honesty and integrity with all of our steel construction services, yet safety is always our top priority. Contact us today to see how we can enhance your project!